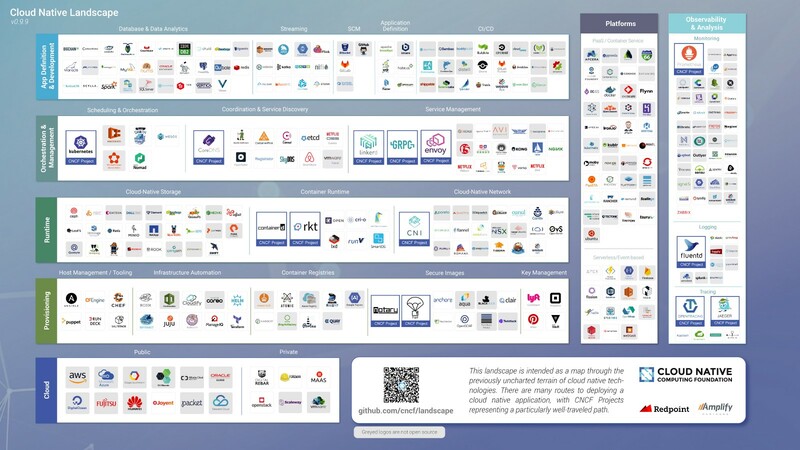 It has been a year since we originally presented the Cloud Native Landscape in conjunction with the Cloud Native Computing Foundation (CNCF) and Amplify Partners. Since the initial working exhibit, we’ve incorporated feedback from the community and continuously iterated to improve the landscape. On October 23rd, we published our most recent edition v0.9.9. Over the past year it’s been wonderful seeing the community’s involvement and enthusiasm for the initiative. Considering the anniversary, we wanted to look back and analyze the landscape’s metamorphosis. Categorization stays relatively consistent. All the broader categories have remained constant except Infrastructure, which we redefined as Cloud to better reflect both public and private offerings. Importantly sub-categories have become more precise, and we’ve added additional groups. As we move up the stack, we see that Provisioning now includes Key Management (e.g. HashiCorp’s Vault) and Container Registries (formerly Registry Services), which previously lived in Application Definition & Development. We also classified Cloud-Native Storage and Cloud-Native Network offerings as Runtime. The App Definition and Development tier transformed the most with the expansion of Databases to include Data Analytics; addition of Streaming; removal of Languages & Frameworks and 3rd Party APIs; and recategorization of Registry Services. Saliently, Platforms broadened to encompass Serverless/Event-based solutions (e.g. Platform9’s Fission). The number of ecosystem players exploded. Since the original landscape the total number of projects and companies has nearly tripled from 116 to 337. 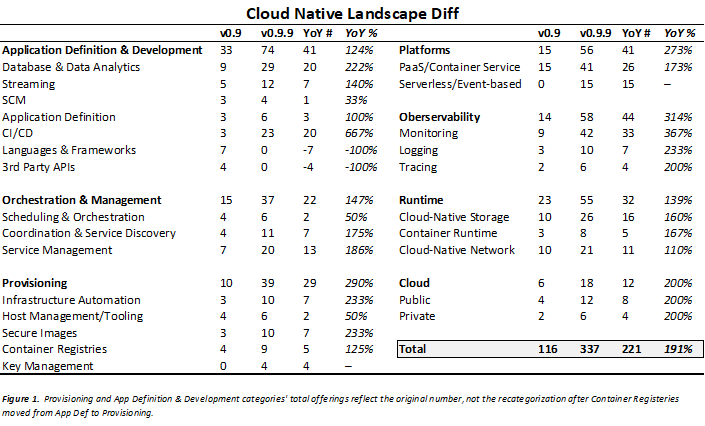 Observability (+44) experienced the largest growth while Cloud (+12) saw the least expansion. Double clicking, the sub-groups Monitoring (+33) and PaaS/Container Service (+26) expanded the most while SCM (+1) remained relatively consistent. Interestingly the number of solutions available in every category increased if we exclude the categories that have been removed from the landscape (figure 1). CNCF projects more than triple. When we published the landscape on November 8, 2016, the CNCF stewarded only three projects: Kubernetes, Prometheus, and Opentracing. The landscape exhibited five additional projects Linkerd, GRPC, Envoy, fluentd, and rkt that CNCF eventually voted into its portfolio. CNCF now hosts 14 projects including two security projects, Notary and TUF, which were added on October 24, 2017 (figure 2). Kubernetes takes the lead. Kubernetes evolved out of Borg, a container cluster management solution built by Google for internal use. Since its initial release in July 2015, Kubernetes, the first CNCF hosted project, has become the most popular container orchestration engine. SDxCentral’s “2017 Container and Cloud Orchestration Report” indicates Kubernetes is in use almost twice as much at 64% than alternatives Docker Swarm at 36% and Apache Mesos/Mesosphere at 18% (respondents could choose all that they used). Kubernetes’ reach has expanded beyond test/dev. The New Stack’s “The State of Kubernetes Report,” noted that of the 470 developers surveyed, some 27% of respondents stated their organizations have already adopted Kubernetes broadly in production. In September Mesosphere announced support for Kubernetes on its DC/OS platform and in October Docker announced native support for Kubernetes. Three of the top four public cloud providers — Google, IBM and Microsoft — offer Containers-as-a-Service (CaaS) platforms based on Kubernetes. Microsoft even rebranded Azure Container Services (ACS) to AKS, with the “K” standing for Kubernetes. There are also start-ups offering managed Kubernetes-as-a-Service for multi-cloud environments like Platform9. The battle for the orchestration layer has been tough, but it looks like Kubernetes is the frontrunner. The future includes Serverless/Event-Driven applications. We wanted to highlight the addition of the Serverless/Event-Driven category because it demonstrates the continuous evolution of application architectures and increasingly rapid innovation cycle. Serverless is the next logical abstraction layer since it allows developers to further decompose services to extract even greater value. While developers currently use serverless technologies for background services like cron jobs or storage bucket upload post-processing, as FaaS platforms become more performant and predictable, serverless will be adopted for broader range of use cases. Like the transition from VMs to containers that generated heterogenous environments, we envision a world where composable applications incorporate both containers and functions, each leveraged for their respective strengths. Kubernetes-native FaaS platforms like OpenFaaS, Bitnami’s Kubeless, etc., demonstrate that many developers like solutions that facilitate interoperability between the old-ish and the newer. Here at Redpoint we published a working landscape identifying 60 FaaS offerings to provide clarity around the quickly evolving ecosystem. It’s been incredible watching the solutions inspired by and often born within the hyperscale computing environments shared with the broader community. Over the past twelve months we’ve witnessed increased excitement and solution proliferation combined with improved clarity around cloud native architectures. A huge congratulation to those involved in these projects and cheers to the year ahead!